In(1)recent decades interest has been renewed in incised script-like signs [now referred to as the "Old European (OE) script"] found on artifacts dating to the middle Neolithic Vinča-Tordos culture of Yugoslavia and western Romania. Although evidence of these signs had been known since the late 19th century excavation at the site of Tordos (Turdaş) (2) in Transylvania, it was the discovery of tablets at the nearby site of Tartaria in1964 that kindled a wave of controversy regarding both the origin and chronology of the signs. The claims of certain scholars that the signs were influenced by early Mesopotamian script (c. 3000 B.C.) not only disregarded the possibility of independent European innovation in sign usage but also presented the supposed Mesopotamian origin of the signs as a refutation of the new and radically altered Neolithic chronology, based on radiocarbon dating, for southeastern Europe. However, while archaeologists have continued to clarify and substantiate the new chronology (e.g. Renfrew 1973), the issue of the signs has been side-stepped in most analyses dealing with the middle and late Neolithic cultures of southeastern Europe. The author's participation on excavations in former Yugoslavia and his interest in the signs eventually resulted in the opportunity to visit excavations and to study museum collections in Romania, former Yugoslavia and Bulgaria. 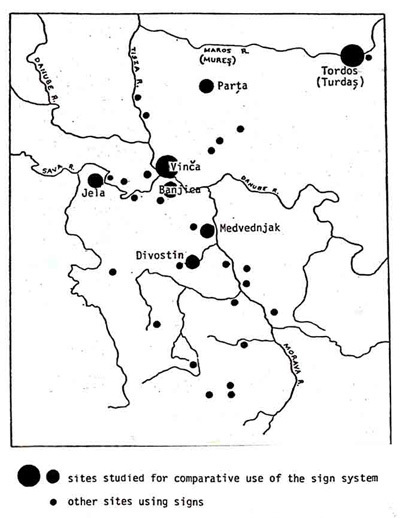 Signs were collected from approximately 50 sites belonging or related to the Vinča culture, named after the important site of Vinča (see map, Fig.1) on the Danube River, near Belgrade. The earliest use of signs, dating to the Vinča-Tordos phase of this culture, is best evidenced at the site of Tordos in Transylvania. The purpose of the present article is to introduce and evaluate new evidence for the sign system and to appraise the consistency of the evidence with the conclusions reached earlier by the author in his published study of the signs (Winn 1981). (3) Therefore, the conclusions reached in the previous study are only briefly reviewed herein.